Some of the most ardent opponents of a national identity card — the Real ID — are among the most patriotic, trustworthy and loyal-to-their-country folks around. State Rep. Jim Guest, R-King City, and others like him are the kind of people who score all A’s in government class. They salute the flag and would fight to defend it. They actually have read the Constitution, thought about it and formed opinions based on it. In brief, they put more trust in the rights that the Constitution guarantees than they do in politicians, bureaucrats and whoever happens to be contemplating infringing on their rights at this current moment in history. And yet, Rep. Guest (not your average politician, to be sure) and those who support him do not want to overthrow the government. They accept the rule of law, the need for some government regulations and the idea that government can be a means for good. But they draw the line on certain things, quickly and decisively. One of these is the notion that the federal government’s Real ID national driver’s license initiative is harmless and necessary to ward off terrorists. These opponents see the mandate as a threat to states’ rights and to the right to privacy. They also reject the notion that just because Missouri has not signed on to the Real ID, somehow our state’s residents will be denied the opportunity to board an airplane or enter government buildings. They believe it never will come to that, nor should it. The crux of their convincing argument is that the security of Missouri driver’s licenses was greatly increased in 2005, when new rules required drivers to provide birth certificates for new IDs or renewals. Rep. Guest and his supporters won a 32-0 vote in the state Senate and an 83-69 vote in the state House. All that remains is for Gov. Jay Nixon to add his signature, and Missouri will become the 13th state in the nation to bar officials from adopting the national driver’s license standards. Federal authorities will be disappointed, but sometimes the easy way to do something is not the best way. Just because someone thought it was a good idea to go around the states in forcing a federal ID card on the general population — by way of driver’s licenses — doesn’t make it right. My buddy Shane, a post 9-11 dust hunter in NYC, sent me this c/o Wired Magazine. CongressDaily's Chris Strohm writes in TechCentral's latest Issue Of The Week that after four years of effort, federal and state officials believe they are finally closing in on new legislation to replace a controversial 2005 law that set national standards for driver's licenses and identification cards. Sen. Daniel Akaka, D-Hawaii, is expected to introduce the bill -- called the PASS ID Act -- that would repeal card requirements set forth under the so-called REAL ID law. State governments -- several of which rejected the REAL ID law outright through acts of their legislatures - are expected to back the new bill because many of its key provisions originated with the National Governors Association. The Obama administration, while silent about the emerging bill, has been engaged in talks with the NGA over legislative changes to REAL ID. The bill would require the Homeland Security Department to conduct a nine-month rulemaking process to establish security standards for state identification cards. One year after the regulations are issued, state motor vehicle departments would have to begin issuing cards that are in compliance, according to the most recent draft of the bill, obtained by CongressDaily. All states must be in compliance within five years or their citizens could not use those cards for federal purposes, such as entering federal buildings. Read the full story here. WASHINGTON - May 18 - Minnesota Governor Timothy Pawlenty signed legislation on Saturday that prohibits his administration from turning the state driver's license into a national identity card and from imposing new burdens on taxpayers, citizens, immigrants and state government. The state legislature overwhelmingly endorsed the bill with a unanimous House vote and a 64-1 vote in the Senate. Minnesota becomes the 23rd state to reject the Real ID Act of 2005, raising the question of why Congress has not repealed the law. "23 states have now sent a clear message to Washington that they will not submit to wrongheaded federal mandates that waste state tax dollars and put privacy at risk," said Christopher Calabrese, Counsel of the ACLU Technology & Liberty Program. "Congress should take notice and repeal the Real ID Act so that effective driver's license security policy can be developed." As part of creating a national identification card, the Real ID Act of 2005 also mandates that states hold all Americans' private information in a single database that is accessible to federal and state officials - the cost and security of which is unknown. 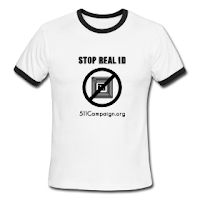 Consequently, the National Governors Association and the National Conference of State Legislatures have expressed strong opposition to the Real ID Act. Since its enactment - as evident by the rejection of 23 states -- Real ID has faced significant resistance on the state level. 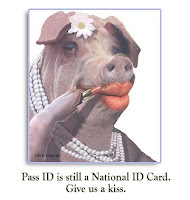 During her January confirmation hearing, Department of Homeland Security (DHS) Secretary Janet Napolitano called for a review of Real ID, saying the states were not consulted enough in its creation and that the initiative is a fiscal burden on the states. Before heading up DHS, Napolitano was Governor of Arizona, where she enacted legislation prohibiting her state from complying with the requirements of Real ID. Because Real IDs require significantly more background information than a driver's license, privacy experts fear that the government will now have access to an unprecedented amount of highly sensitive information about citizens and that there will be an exponential rise in identity theft from the database where the information is stored. Keep Calling your Legislators folks and remember to keep calling the Governor of Missouri. We can win this battle in NC, TX, and PA if we keep up the good fight. Every federal and state-elected official took an oath to uphold the U.S. and Pennsylvania constitutions. It is imperative those in public office start taking these oaths seriously, be cause each day that goes by, more and more of our rights and freedoms are being lost, and government's appetite for collecting personal and private data continues to grow. The federal government says this plan will protect Americans from terror ists. I disagree. I believe it is a clear violation of the 10th Amendment of the U.S. Constitution, redefining privacy as we know it, and creating a mountain of new bureaucracy and increasing fees and taxes -- all without making us any safer. If Pennsylvania were to comply with REAL ID, in January 2010, driver's licenses would become a standardized national identification card with a machine-readable zone containing valuable personal information. PennDOT would then be required to link into a massive na tional database, opening the door to the possibility of major security breaches. REAL ID also threatens privacy rights by empowering the Department of Homeland Security to collect biometric data, including fingerprints and eye scans, as well as placing Radio Frequency Identification chips in every American's driver's license. A proposal by State Sen. Shirley Kitchen, D-Philadelphia, Senate Bill 623, would prohibit government bodies from capturing or releasing biometric data without an individual's approval or knowledge and prevent a slippery slope toward rights being stripped away. Other requirements of REAL ID that take law-abiding citizens down a dangerous path are: what confidential data can be collected from driver's licenses; where and how long it can be stored; and who is authorized to obtain, share, trade or sell that information. With one swipe of a license, an establishment can collect your personal data and use it for marketing purposes. State Sen. John Wozniak's, D-Clearfield, proposed legislation (Senate Bill 622) would restrict information that can be made available from driver's licenses for marketing or other purposes beyond law enforcement. If we don't exempt ourselves from REAL ID by the end of 2009, we are in real danger. This act is a major violation of Americans' right to privacy and another example of the federal government overstepping its boundaries with the states -- all with an anticipated unfunded federal mandate cost of $11 billion to already financially strapped states.